Can Netanyahu Repair the Rift With the U.S.? settlement construction and move toward a two-state peace with the Palestinians has reportedly spurred Minister-without-Portfolio Yossi Peled to recommended that Israel shop outside the U.S. for aircraft and military hardware, sell sensitive technology to clients disapproved of by Washington, and invite America’s rivals to play a greater role in the Middle East. And if that sounds like chutzpah given the continued U.S. direct aid to Israel  $2.5 billion in military aid this year alone  two Israeli newspapers reported Wednesday that Peled had even proposed that Israel use its influence with some Democratic donors in the U.S. as leverage against Obama’s positions. The Administration’s position leaves Israel little wiggle room on settlements  a huge problem for a right wing-led government whose coalition agreement is premised on continued construction in the occupied territories. And as he shapes up to deliver a major policy address Sunday billed as a response to Obama, Netanyahu is feeling the heat. Israeli media have reported aides to the prime minister complaining that the White House is seeking a confrontation with Israel in order to ease anti-American hostility in the Muslim world, and even that Obama is seeking “regime-change” in Israel. intentions, because it draws a clear line between those in Israel and among its supporters abroad who support a two-state solution, and those who don’t. Obama is betting the ayes have it. Since taking office earlier this year, Netanyahu has tried to keep his cards close to his chest, but now he’s being forced to reveal his intentions. Opinion polls often find a majority of Israelis willing to give up West Bank settlements in exchange for a genuine peace, and that same majority is unlikely to be willing to jeopardize Israel’s relationship with the United States in order to defend the settlers’ right to build on Palestinian land, a right the settlers say is based on the argument that it forms part of the Biblical Land of Israel. until now been its most presentable leader. 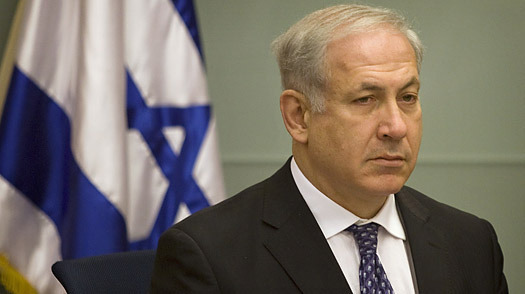 Israel’s Netanyahu: Taking a Turn Toward Pragmatism?